Over 1000 studies: sorted, sifted, scrutinized. Solid research is the foundation — and catalyst for improvement — of the QM Quality Assurance process. 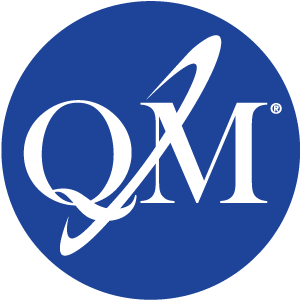 QM Conferences and resources give you access to the QM community — roughly 80,000 strong, with over 1,100 member institutions in the US and internationally. The gold standard for courses, programs and more. From general to specific, QM provides a pathway for benchmarking quality. Objectively. Repeatedly. Predictably. With 8,000 certified reviewers, our exclusive system puts you on track to reach quality assurance goals and improve student achievement. Get in depth and maximize QM. Strengthen your expertise with workshops and resources focused on improving quality. Broaden your skill set with courses for QM Roles. “Having our online programs Quality Matters certified will distinguish them in the marketplace where students have so many choices these days." "Since participating in the QM K-12 Reviewer Course, I have a much better grasp of the rubric, including a deeper understanding of each standard and any corresponding annotation." "It is always refreshing to attend a QM Conference. The enthusiasm and collaboration felt is contagious in a good way." 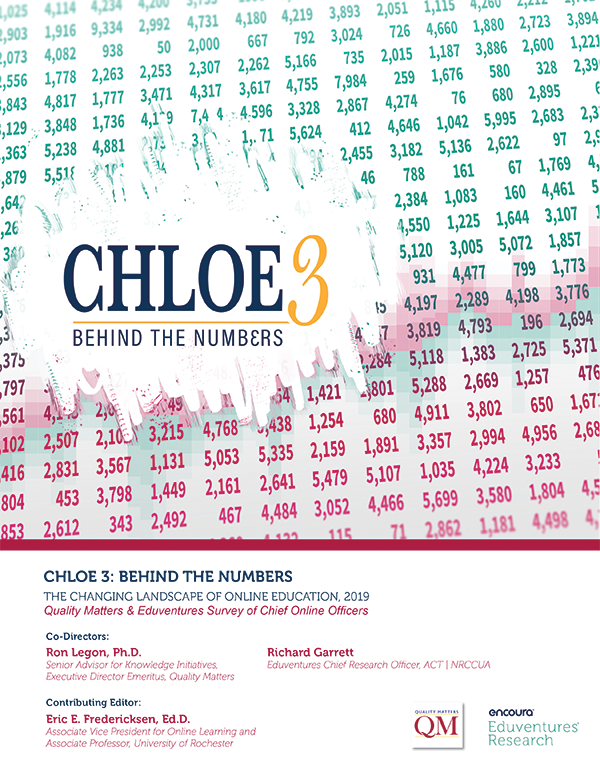 NEWLY RELEASED — Results from the third survey of chief online officers are available in the CHLOE 3: Behind the Numbers report. The third installment of The Changing Landscape of Online Education research project led by QM and Eduventures reveals new insights on institutional approaches to online learning and offers five models for understanding them. The online education environment continued to change in 2018 with institutions adding more online programs and technology to support student success. Leading the way — QM member institutions. See what they did, how they did it and what’s next in our third annual QM Community in Review report. If you’ve been looking for solutions to help ensure that learners are engaging with high quality courses, QM has them. Through course improvement, professional development and robust review processes, QM empowers you to deliver on the promise of online learning. Shine a spotlight on the ideas, data-driven policies, research, and experiences that are propelling your quality assurance efforts forward. What’s working (and isn’t!)? What’s making a difference for learners? How is using QM review processes helping your institution differentiate itself? The QM Community wants to know! A QM-Certified Course is an online or blended course that has met QM Standards for a QM Rubric in an Official Course Review. Once certified, organizations can display the QM Certification Mark to demonstrate their commitment to quality and continuous improvement. QM’s five Rubrics are comprised of General and Specific Review Standards, allowing for complete course review. The Standards are research-supported and based on published best practices. QM Rubrics are an essential part of creating, certifying and maintaining quality course design. Deb Adair, QM Executive Director, will participate in sessions at this conference. See the results from the third survey conducted by QM and Eduventures as part of The Changing Landscape of Online Education (CHLOE) project. CHLOE 3 breaks new ground in identifying a number of different institutional approaches to online learning, as crystalized in the descriptions of five models. From K-12 to higher education and from local to international, our member community is feeling the impact of the changing online education environment. 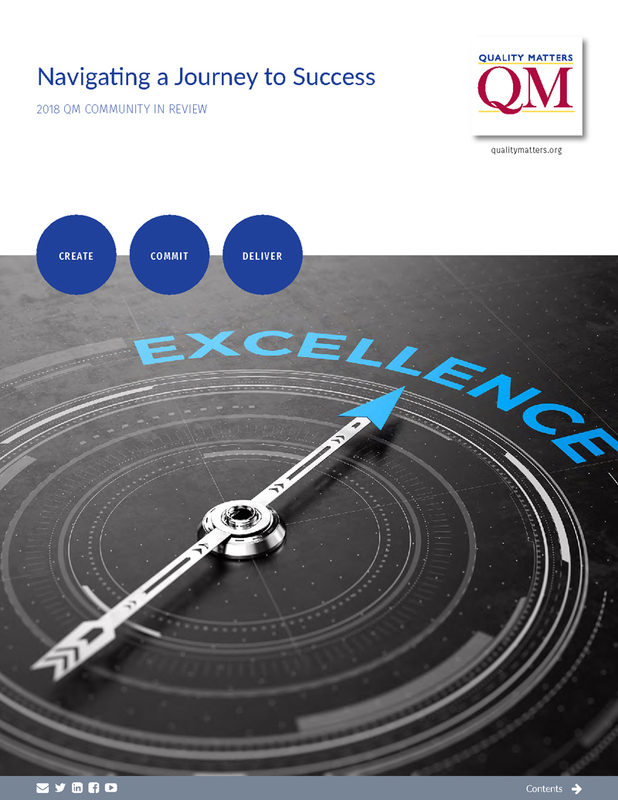 See what the QM community accomplished together in 2018 as we continued "Navigating a Journey to Success". Read how schools and districts in several states have embraced quality assurance for online learning by using Quality Matters. Notre Dame of Maryland University, Broward College, Anne Arundel Community College, and others share their use of Quality Matters to evaluate and improve online courses.